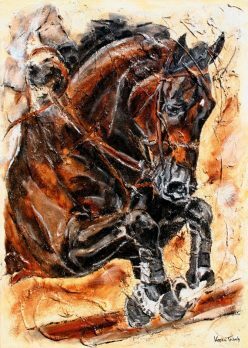 Spirit and vibrant motion of powerful horses with unique motifs. and your affinity to art. and come very close to the original. colour brillance in perfect design. Due to their individuality they constitute unique and at the same time timeless values. 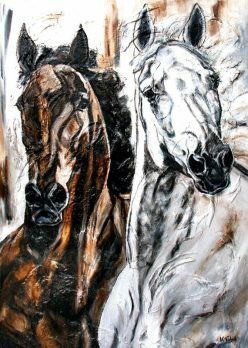 All paintings from Kerstin Tschech are unique items and hand-made. 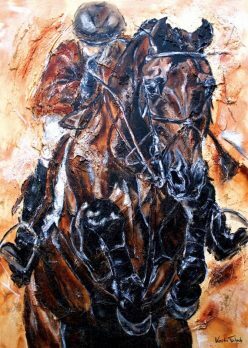 They provide admirers of art and horses with an opportunity to acquire authentic originals and to enhance their home or business rooms with prestigious pieces of art. At special request exclusive pieces can be commissioned. Prior to actually starting on the work, style, material and dimension will individually be determined with the customer. The options for this paintings ranges from abstract all the way to figurative. You can get in contact with the artist and your ideas will be determined. 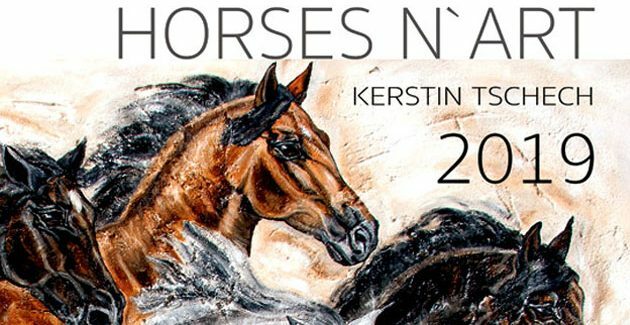 You will find dates of new Art Exhibitions of Kerstin Tschech on the website www.kerstin-tschech.com. 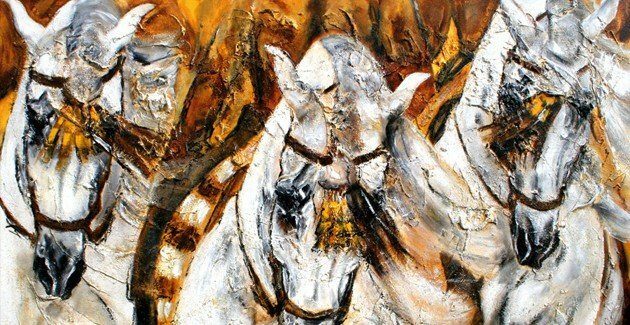 The most exhibitions on the topic “Horse” will take place in Europe. On the website you will also find an Art Gallery on available and sold paintings. EXCLUSIVE -high-quality design in brilliant colours. Individual glas stages as an eyecatcher for your home or office. NEW!! 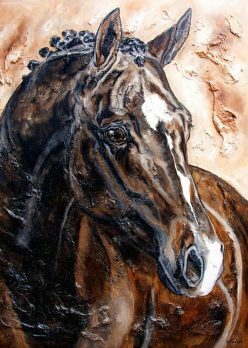 HORSE ART CALENDAR 2019 available ONLINE here. Unique print method with handmade structure on canvas. These high-quality Art Prints, which may individually be furnished with a frame, are a real eyecatcher. The 300 g chromoluxpaper impresses with colour brilliance and colour saturation. 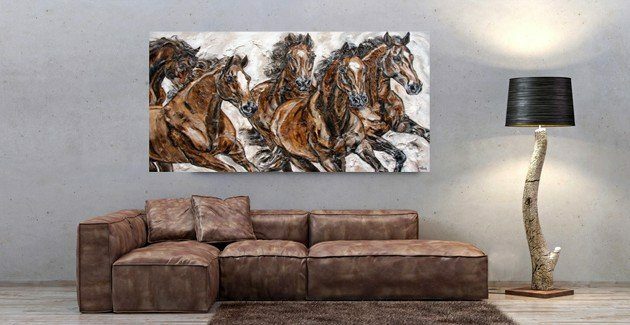 So you can adorn your rooms with selected horse motifs at an attractive prize. 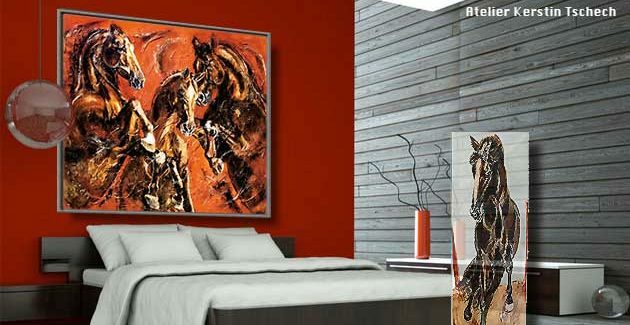 Through these reproductions your passion for horses can move all the way into your home. The special printing process allows the canvas to come very close to the original painting. The high-end quality accounts for the colour intense reproduction of the motifs. Those exclusive reproductions impress with their texture - hand-made and accounting for the vividness of the picture. 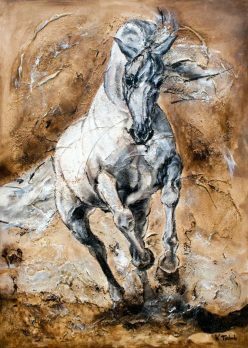 This emphasizes the horse´s spirit and the vibrant motion. All reproductions are custom-made and come very close to the original. Through this innovative printing procedure an almost painting-like result is achieved. The simple elegance of the aluminum emphasizes that effect. 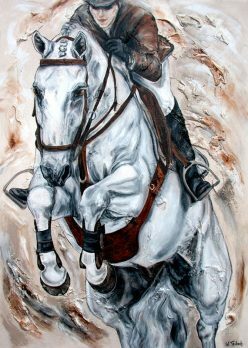 This piece of art may be placed indoors as well as outdoors, making it also suitable for riding halls, offices, terraces etc. For the most noble and high-end reproduction of the paintings a print on Acrylic Glass is recommended. This kind of reproduction impresses with a high-glossy look and intense brilliant colours and accounts for special three-dimensional depth and timeless elegance.